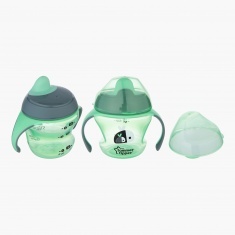 Tommee Tippee Easy Drink First Cup | Multicolour | Designed to help your little one develop grown­ up drinking skills. Specially designed according to the tiny hands of your little one, this cup is sure to help your kids drink water or milk on their own. The sturdy handles make it easy to holds while the soft spout fits in the mouth of your kid helping him drink comfortably. Feature 2 : Super soft spout is gentle on your baby's gums when teething. Feature 1 : Designed to help your little one develop grown­ up drinking skills. Feature 3 : Removable easy­-grip handles are perfect for little hands.